Fruity Loops 8, the new version is flexible audio and control data routing, free-form Playlist design and interoperability with industry standards. It will play any sample file (wav), generator(softsynth, VSTi & DXi) or midi instrument you feed it. Wav, mp3 or midi songs or loops can be created only minutes using fruity loops. Fruity Loops(known as FL Studio) is a fully featured, open-architecture music creation and production environment for PC. No extra software is required to produce any style of music, as a complete kit of instruments and studio tools is included in the cost of the package. With the included plugins, sounds and tools the user can create complete songs, backing tracks, loops or sizzling beats. 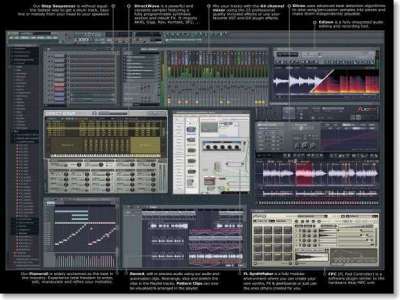 Fruity Loops is a fully featured, open-architecture music creation and production environment for PC. No extra software is required to produce any style of music, as the complete set of instrument and studio tools is included in the cost of the package. With the included plugins, sounds and tools the user can create complete songs, as well as backing tracks, loops and sizzling beats. Completed songs can be saved to WAV, MP3 or MIDI or .ZIP or native project formats (.FLP). Fruity Loops utilizes MIDI and DirectSound (internal mixing), 16-bit 44KHz stereo output, and 32-bit floating-point internal mixing. You'll also get support for VST plug-ins, as well as individual panning, volume, pitch, mix, resonance, and cutoff on each note. Fruity Loops demo version does not allow you to save your project, but does include all of the program's features. You can even test the rendering to wav, midi & mp3 options, or produce gigabytes of loops and songs for free. There are as to be expected some pretty nice features in Fruity Loops Studio 8. We hopped over to the official page to get the news. Here are a few of the ones we thought. What's new in Fruity Loops 8 ? Fruity Loops 8 is flexible audio and control data routing, free-form Playlist design and interoperability with industry standards (VST/VSTi/VST2, DXi, DXi2, Buzz, ReWire, MIDI, MP3, WAV, OGG). Didier as the Chief Software Architect notes ”We don't try to protect our data & come up with new formats only for marketing reasons. We use existing standards as much as possible, and allow FL Studio to be used as a plugin in other hosts“. In version 8, particular emphasis has been given to improved workflow through enhanced interface design.